Take a look behind the scenes and see how a painting arise. The work of Carmen Botermann as a painter is different from her profession as a make up artist. In her series 'prospects of life' Carmen did digest multiple impressions from her stay in Cornwall for example - as you can see in the picture 'Die Nächestenliebe' (charity). 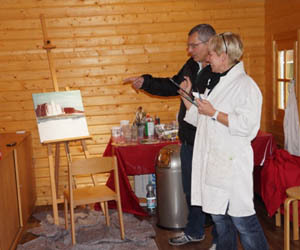 Carmen explains, that she 'dreams' a picture, before she get started with her work in front of the canvas. To determine a motive, Carmen marks the outlines of the objects on the canvas, after she has chosen the size of the canvas. In this early phase she also decides which technics should surround the picture. Carmen likes to use media which provides some kind of haptics - a 3D-effect - while she integrates other materials into the picture to get a sculptural expression, for example.